Yearstretch can create specific genetic algorithm powered solutions wrapped in an end user program that can be distributed to your own clients or to staff within your own organisation. Instead of using Excel to host your model we can build your model into a normal Windows program interface along with the GASolver math; then compile them both into an efficient package that can then be installed on any normal MS-Windows computer. These pre-packages use the same math as GASolver but run as standalone programs that do not need MS-Excel. If you tend to solve the same model over and over again for different conditions then a packaged version will save you time. If you want to give your staff, or your clients, access to a particular solver but prefer to hide the math IP or wish them to be able to use a ruggedised version then a packaged solution is the answer. The speed of the packaged solver exceeds that of GASolver within Excel by an order of magnitude or more. The math for your model is hidden from the user, in Excel is it available for all to see. The program can be branded as your own company's product if you require to distribute solution finders to your customers. The program can be provided with only the minimum user controls for safe and sure use by non-expert users. The packaged version of Example 3 is available for free download so to evaluate an example of pre-packaged solver download the program below. You may want to print this page of instructions for use offline. Click on the download link below to download the installation package file. Choose 'Save' if prompted and specify a folder in which to save the downloaded file. If you have a previous version installed then it is recommended that you use the Windows | Control Panel | Add/Remove Programs to remove the previous version before adding the new one. 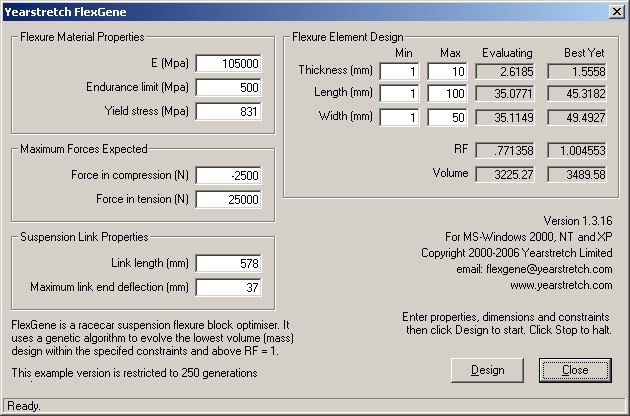 Following download, click on the downloaded file InstallFlexGene.msi from the folder in which you saved it to install the software. If you have any problems or questions then email us at GASolver@yearstretch.com. The installed program will optimise the operating dimensions of a suspension link flexure to achieve a safety factor of 1 at the lowest volume/weight. For detailed description see Example 3 from which FlexGene was created. When installation is complete you can run the program from Start | Programs | Yearstretch | FlexGene or the icon from your desktop. As optimisation takes place you will see the evolved dimensions and volume figure appear. To halt the process at any time, click the Cancel or Close button. Click on Start then Settings then Control Panel OR Click on Start then Control Panel depending on your version of Windows. Click on the Yearstretch FlexGene list entry. Copyright ©1995-2014 Yearstretch Limited. Legal and Privacy statements.